It’s time to turn the page from the trade deadline to the playoff race. With less than 20 games remaining now for every team around the NHL, this stretch run is almost certainly going to come down to the wire. 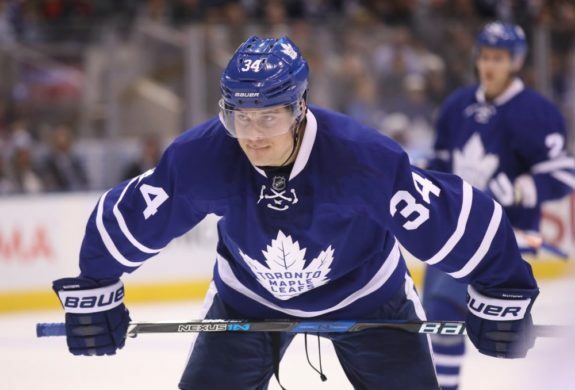 Andrew Forbes, one of our regular contributors to Facing Off and THW’s lead writer for the Toronto Maple Leafs, joins me this week in making that transition from trade season to all things postseason. It’s time to get excited about the upcoming playoffs, especially for Canadian hockey fans. There could be as many as six Canadian clubs making the cut after all seven missed last season — and there is potential for a Battle of Alberta or possibly even a Battle of Ontario in the first round. For those who still can’t get enough trade talk, Félix Sicard and I recapped the deadline midweek in Episode 9 of the Facing Off Podcast. We covered almost every angle, but saved a couple for Andrew . . . Which trade-deadline acquisition — anybody acquired from February 1 to March 1 — will make the biggest impact on his new team? How about come the playoffs, which of those additions will prove most valuable in the postseason? FORBES: Personally, I think there are a few acquisitions that will help their new clubs for the late-season push and possibly into the playoffs. While defence seemed to be a premium at the deadline, there were a few teams that might’ve found exactly what they needed moving forward. For the Rangers, adding Brendan Smith helps shore up their depth on defence for what they hope will be another playoff run. They surely aren’t favourites heading down the home stretch and into the NHL’s postseason, but the impact of having a big, physical rearguard like Smith should solidify their back end. That being said, the Penguins also picked up a defenceman that should help them in their playoff run. After getting Ron Hainsey, the Pens went out and grabbed Mark Streit. While he’s not the Streit of old, he can still get it done and he might be one of the less talked about pickups of this year’s deadline. FISHER: Interesting that Andrew went with two defencemen from the Metropolitan Division and didn’t mention Kevin Shattenkirk. He seemed like the slam-dunk answer here — it was almost an alley-oop for Andrew — but I’m actually glad he went in another direction. Shattenkirk’s ability is obvious — he was the most talented player moved ahead of the deadline — but Washington was already in good shape on defence, so he might end up being more of a complementary piece to the Capitals’ puzzle. However, if and when the Capitals face the Rangers or Penguins in the playoffs, those teams might be wishing they anted up for Shattenkirk instead of settling for Smith and Streit. Time will tell. Alex Burrows is off to a great start in Ottawa and Martin Hanzal has been making an immediate impact for Minnesota, but something tells me Thomas Vanek is going to flourish in Florida. The Panthers aren’t a playoff lock by any means, but I think Vanek will help them get in and possibly go further than most expect. Call it a hunch, but I’m shocked that Vanek only fetched a third-round pick and a presumed bust in Dylan McIlrath. Some teams are going to wish they had beat that offer, and the Edmonton Oilers might be among them. I have a feeling Jarome Iginla still has some big goals left in him too, but I wouldn’t bet on it. Smart money is on Shattenkirk and Hanzal, but I’m rolling the dice on Vanek. Which trade-deadline acquisition will leave his new team wanting more? Who will be the biggest bust or disappointment come playoff time? Which general managers will regret the moves they made or didn’t make? FORBES: I think Vanek will start to decline in his new role with the Panthers. His numbers this season with the Detroit Red Wings were impressive — but inflated. The truth is, he was a good player on a terribly disappointing team. Now, with his role decreased on a much younger club, Vanek will see a dip in his numbers. That, along with his history of being a first-half player over his career, and he might disappoint Panthers’ management and fans down the stretch. Marc Bergevin made a few moves at the trade deadline, but it’s debatable whether Montreal’s roster is truly improved. As for GMs that might regret what they didn’t do. I’ll keep it simple. The Canadiens needed scoring. They shored up their fourth line but didn’t get offensive help at a time when their production isn’t where it should be for a team hoping to do damage in the playoffs. Now, with Alex Radulov out for a little while, that takes one more offensive threat out of the Montreal lineup, which could hurt the Habs’ seeding in the busy Eastern Conference. 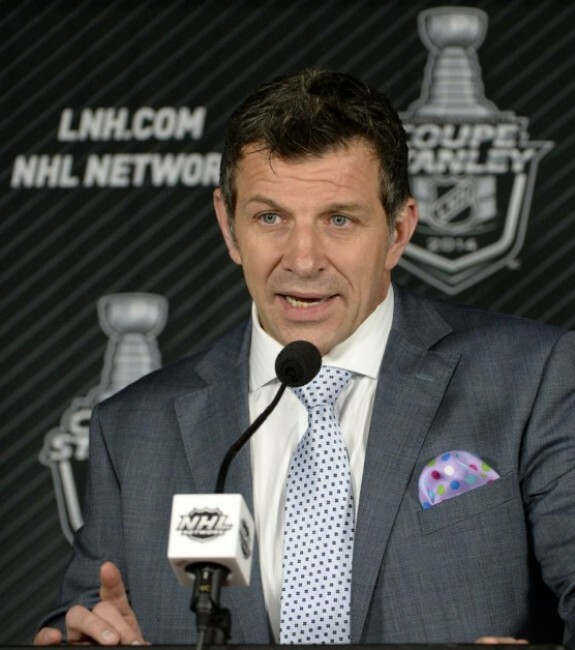 FISHER: I don’t necessarily like the moves Montreal made either, but we’re obviously at odds over Vanek. I like him to have the biggest impact and Andrew is anticipating he’ll become the biggest disappointment. On second thought, I’m not willing to bet on Vanek either. He’s enigmatic and has a lot of Marian Gaborik in him, but if Vanek starts drinking from the same fountain of youth that Jaromir Jagr has found in Florida, the Panthers will reap twice the benefits. Despite his two-goal debut, I still think Burrows is going to leave a lot to be desired for the Senators. I can’t really see Ottawa getting out of the first round, and Jonathan Dahlen would definitely be a first-round pick if he were eligible for this year’s draft. It might not backfire as badly as Filip Forsberg for Martin Erat, but I don’t see how that deal ever goes down as a win for Pierre Dorion. 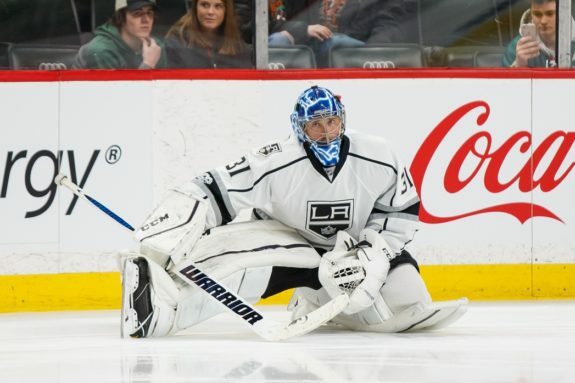 Ben Bishop was the only NHL goalie dealt at the deadline, going to the Los Angeles Kings as a rental. Dean Lombardi made the bold move to bring in Ben Bishop, but that could prove regrettable too — and not because Bishop got beat by Vancouver on Saturday night. The bounces went against him in that game, but what if Bishop outplays Jonathan Quick down the stretch and the Kings do get into the playoffs? Who starts Game 1 for Los Angeles? Lombardi opened the door for a goaltending controversy that could have lingering effects if Darryl Sutter doesn’t go with Quick in the postseason. At least Lombardi was trying to be proactive, for better or worse. The same can’t be said for Garth Snow, the Islanders’ general manager who inexplicably did nothing at the deadline — failing to move Jaroslav Halak or make any improvements to his bubble team. Snow is typically more of a risk-taker, and I’m surprised Peter Chiarelli did so little to address Edmonton’s needs too. Apparently, they were talking, so we can only assume something fell through between them. Does the NHL have “false parity”? Are you a fan of the current point system — with all the three-point games — and how close the standings appear as a result? If not, what changes would you make? FORBES: I’m not a fan of the three-point system at all. While the standings wouldn’t change in a big way, they would change and that should be something that the league takes notice of. Are the best teams really making the playoffs? Or are we seeing some mediocre clubs making it because they know how to play for the single point? The 3-on-3 is exciting in overtime. Keep it. But extend it to 10 minutes. If someone doesn’t score, then neither team deserves two points. End it in a tie. Heck, you get enough overtime in playoffs now anyways because teams are so used to playing for the extra point. FISHER: Oh no, anything but ties again. I like the 3-on-3. I like the shootout, to a lesser degree. And, more than anything, I like looking at the standings on a nightly basis and seeing the vast majority of the league still within striking distance of the playoffs three-quarters of the way through the season. Call it “false parity” — and that does seem to be a catchphrase lately — but it makes for a more suspenseful finish and almost every fan base has reason to cheer into March. That hasn’t always been the case. The NHL has a good thing going, finally, and I wouldn’t change a thing with regards to the points system and tiebreakers. More of the same, please. How about the playoff format? Do you like the divisional brackets and rivalry matchups or would you alter that? Should the NHL go back to the 1-vs-8 seeding? FORBES: I don’t mind the divisional matchups and the top seeds taking on the wild-card teams. However, I would get rid of the divisions and have the top eight teams from each conference make it. There are some good clubs that might not make it because of the divisional standings. Right now, the New York Rangers would be taking on a top seed because they are a wild-card team based on the NHL’s standings format. Over the past five or 10 years, the league changed so much in the hopes of creating more rivalry. Personally, I think they changed too much, too fast. On top of that, I would love to see more inter-conference matchups. Maybe we could see a little more of the forced rivalry of Matthews versus Laine. FISHER: Hopefully this is the last year of the current playoff format. I mean, everybody knows the Eastern Conference Final is going to pit Pittsburgh against Washington in the second round again this spring. Yes, you read that right. The Metropolitan bracket is shaping up to be far superior for the second year in a row, and it’s a shame that Sidney Crosby and Alex Ovechkin will be clashing a round too soon. The Atlantic bracket is basically the B-side, the consolation tournament. Whoever comes out of there probably won’t stand much chance, and it wouldn’t be surprising if the fourth-place Metro team emerges from the Atlantic. Look, I like rivalries as much as the next guy and I’d be fired up for an all-Canadian battle in the opening round, but that doesn’t make it right. For a while there, the Metro’s fourth seed had more points than the Atlantic leader, yet wouldn’t have had home-ice advantage in either of the first two rounds. That’s just wrong. This format was good in theory, but it’s time for somebody to come up with a better idea. You know, like 1-vs-8. Speaking of the playoff format and wild-cards, Washington is likely going to be the Eastern Conference’s top seed again. Which of those teams in the mix for the second wild-card spot would scare you the most as a first-round opponent for the Capitals? FORBES: To be honest, quite possibly none. The Islanders are hot right now but, in a seven-game series, they aren’t anything against the high-powered Caps. Same goes for the Flyers, Lightning and Sabres. Auston Matthews and the Toronto Maple Leafs are on a five-game losing skid — albeit with three loser points over that span — but have several winnable games ahead, starting Tuesday at home to Detroit. If the Rangers fall to the second wild-card spot (which is highly unlikely), they would be a tough go for the Caps. At the same time, if the Leafs can squeak in, they might be a team that can go goal-for-goal with one of the better offences in the Eastern Conference. FISHER: The Leafs would have nothing to lose, and that would make them as dangerous as any opponent. All the pressure would be on Washington, but Toronto wouldn’t be a pushover. I wouldn’t go as far as to predict an upset, but I think the Leafs could cause the Capitals some serious stress if Frederik Andersen was able to match Braden Holtby in goal. I could totally see the Leafs stealing Game 1 and getting a third home game before bowing out. Tampa Bay would be even more of a nightmare matchup for Washington. The Lightning know how to win in the playoffs and there is still a chance they could have Steven Stamkos back by then. I realize Tampa sold at the deadline, dealing away Bishop, Brian Boyle and Valtteri Filppula and even flipping Streit, but if the Lightning go on a run to get in, they will be a tough out — with or without Stamkos. How about the Western Conference, do you see any live underdogs there? Which team(s) would you least want to face in the first round as Minnesota/Chicago or San Jose? Patrik Laine is doing his best to power the Winnipeg Jets back into the Western Conference’s playoff race. FORBES: The Kings are always a team that others should fear in the playoffs. Now, with Quick and Bishop, Los Angeles has easily the best goalie tandem in recent memory. The other team that should be feared is Winnipeg. 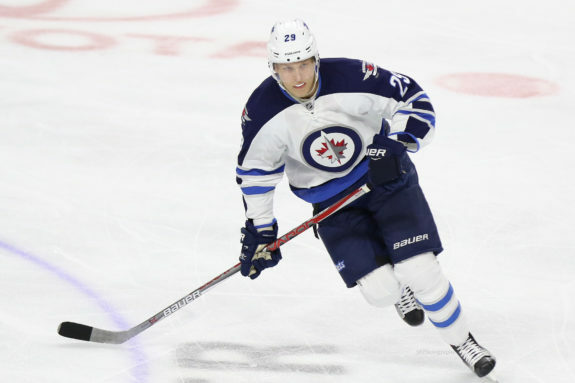 The Jets have one of the newest pure goal-scorers in the NHL in Patrik Laine and some of the best young talent surrounding him with Nikolaj Ehlers and Mark Scheifele. Add Dustin Byfuglien and Jacob Trouba to the mix and they have a solid team built for the playoffs. However, their question mark is in net, which could leave them handcuffed come playoff time (if they make it). FISHER: The Jets are pushing again and Winnipeg would be a raucous atmosphere if they get in, but I still consider them a long-shot. The Calgary Flames, on the other hand, on one of the league’s hottest teams — on a seven-game winning streak right now — and they will be a handful for anybody. More so than the Jets in my opinion, these Flames are built for the playoffs and match-up well with most teams. Brian Elliott was holding the Flames back at the beginning of the season, but now he’s backstopping Calgary towards the playoffs. 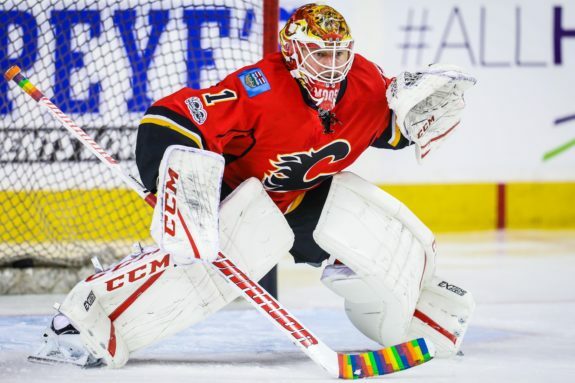 Calgary’s recent surge is making that Battle of Alberta a realistic possibility and although Edmonton swept the season series, the Flames wouldn’t be an easy out, especially not if Brian Elliott carries his current momentum into the postseason. There is still a fair bit of hockey left to be played, but be careful what you wish for Oilers fans. I do think that second wild-card spot is L.A.’s to lose — yes, I know it belongs to St. Louis as of today — and I agree that the Kings are the West’s version of the Lightning in terms of a team with plenty of playoff experience that could rise to the occasion. Either of those Los Angeles goaltenders could get hot and steal a game or even a series. I don’t think the Kings could knock off Chicago or San Jose, but they might be able to give Minnesota fits if that matchup comes to fruition. The Nashville Predators deserve a mention here too. They were underachieving for the longest time but seem to be hitting their stride lately. With the playoff format what it is, the Predators will likely secure the Central’s third seed and be a threat to whoever finishes second there — be it Chicago or Minnesota. A very real threat. That said, I think I’d rather play the Preds or the Kings than the Flames right about now. Last and maybe least, do you have any issue with Islanders prospect Josh Ho-Sang wearing the No. 66? FORBES: My issue isn’t so much with him wearing it as it is with the league not retiring it. Was Mario not good enough? The fact is, if teams keep retiring numbers, eventually there won’t be numbers left for future generations. Can you imagine seeing players starting to wear numbers over 100? It’s never going to happen. That being said, out of respect, I personally wouldn’t have worn that number knowing who came before me. But Ho-Sang has never been one to shy away from controversy in his young career and it makes sense that he would stick to his junior number — even if there was a rash of criticism to follow. FISHER: Ho-Sang really is a lightning rod for controversy, but he’s not the first player to wear No. 66 since Lemieux retired. T.J. Brodie wore it briefly in Calgary and there have been a couple other lesser-knowns too. Granted, Brodie is a defenceman and Ho-Sang a flashy forward with a bit of a brash reputation, but this is a non-issue for me. Much ado about nothing. Sure, it looks a little strange — seeing No. 66 on somebody’s back — but the only number that is off-limits league-wide is Wayne Gretzky’s No. 99. Several players are wearing Gordie Howe’s No. 9 and Bobby Orr’s No. 4. Those numbers are more commonplace, but No. 66 shouldn’t be any more sacred. It shouldn’t be sacrilegious to wear No. 66. Until the league says otherwise, it’s just another number as far as I’m concerned. Who won this round of Facing Off? Feel free to weigh-in with your opinions in the comments below. We will be checking in periodically to both defend and expand on our initial answers. If you want us to face-off over a topic, we’re open to suggestions as well.